Celebrating the launch of the new free tax preparation clinics for veterans in Los Angeles are, from left to right, Congressman Brad Sherman, CSUN accounting professor, CSUN President Dianne F. Harrison, and, from Citi Community Development, Debbie Taylor, Ruth Christopherson, James Alva, Rashi Kallur and Laura Peralta. Photo by David Hawkins. 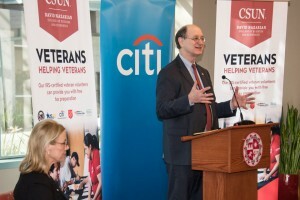 California State University, Northridge (CSUN) announced today the launch of new free tax preparation clinics for veterans in Los Angeles, an innovative effort in collaboration with Citi Community Development and the Los Angeles Veterans Administration. Now through April 15, CSUN’s Volunteer Income Tax Assistance (VITA) clinics will offer free services specifically targeting veterans, including financial training and efforts to ensure eligible filers receive their Earned Income Tax Credit (EITC). Those eligible must have had an annual household income under $54,000 in 2017. The Internal Revenue Service (IRS) estimates that more than two million veterans nationwide are eligible for the EITC. Yet, according to the most recent data, only 425,042 veterans — 21 percent — claimed the EITC in 2017. In Los Angeles County, where an estimated 70,000 veterans are eligible for the EITC, only 5 percent took advantage of the credit in 2017. While there is a maximum gross income limit per tax return set by the IRS, the limit of $54,000, in California is approximately the average income of a Los Angeles resident. CSUN President Dianne F. Harrison looks on as Congressman Brad Sherman talks about the launch of new free tax preparation clinics for veterans. Photo by Lee Choo. 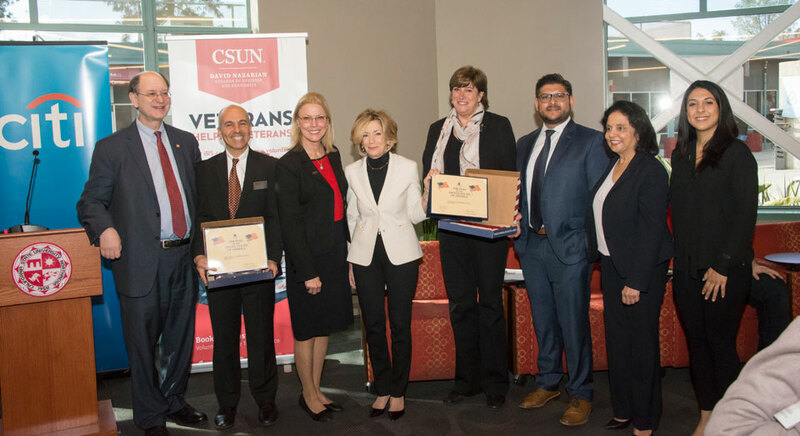 With funding support from Citi Community Development, CSUN has trained veteran volunteers as IRS-certified tax filers with the goal to assist an estimated 4,500 of their veteran peers in filing their taxes, claiming tax credits and developing positive financial budgeting habits. Throughout tax season veteran volunteers will provide support to veterans at nine veteran centers throughout Los Angeles County. This innovative peer-to-peer approach is aimed to increase veteran EITC filing for the 2017 tax year. Congressman Brad Sherman, D-Sherman Oaks, praised the program. The program is staffed by IRS-certified veteran volunteers and will be available to taxpayers six days a week at 20 sites throughout Los Angeles County, including 9 sites exclusively serving veterans. A list of locations, dates and times can be found on the CSUN VITA website. Last year, more than 345 student volunteers provided free tax preparation assistance to more than 6,000 low income individuals through CSUN’s VITA Clinic. Citi Community Development has invested $2.6 million to support free tax preparation services for eligible people in twelve major cities and regions across the country. In addition to the support from Citi, the program’s mission has long been supported by such philanthropists as Harvey Bookstein, a CSUN alumnus and one of California’s most respected certified public accountants, and visionary businessman David Nazarian, also a CSUN alumnus. Serving more than 40,000 students each year, CSUN is one of the largest universities in the United States, and it has an impact to match its size. Money Magazine recently named CSUN one of the top ten values in all of higher education, and the Social Mobility Index ranked CSUN fifth in the nation for elevating its students’ economic and social well-being. CSUN ranks 10th in the country in awarding bachelor’s degrees to underrepresented minority students, fifth nationally in awarding master’s degrees to Hispanic students and enrolls the largest number of deaf and hard-of-hearing students of any U.S. state university. CSUN’s 171 academic programs and engaged centers enjoy international recognition for excellence. CSUN currently partners with more than 100 institutions of higher education in 22 countries around the globe and attracts the largest international student population of any U.S. master’s level institution. Situated on a 356-acre park-like setting in the heart of Los Angeles’ San Fernando Valley, the campus features modern educational buildings and world-class LEED Gold-certified performing arts and recreational facilities recognized as among the best in the country. CSUN is a welcoming university that champions accessibility, academic excellence and student success. Citi Community Development (CCD) leads Citi’s commitment to financial inclusion and economic empowerment for underserved individuals, families and communities across the U.S. Through innovative collaborations with municipalities, community groups and leading nonprofit organizations, CCD harnesses Citi’s expertise, products and services to help expand opportunity for all.